Scenic Eclipse is redefining the standard of ocean cruising, providing guests with unparalleled underwater experiences on board the Scenic Neptune U Boat Worx Cruise Submarine 7. Capable of diving to 300 metres, or 984 feet, with seating for up to six guests, the submarine has been custom-built for optimal sightseeing of marine wonders, offering guests an excursion into the wide blue depths, and unique access to some of nature’s most beautiful sites. Scenic founder and chairman, Glen Moroney, says the submarine will offer guests a unique opportunity to go below and beyond. “Scenic has always sought to venture beyond the horizon, and with our submarine we provide guests with the opportunity to enjoy access to some of nature’s most beautiful marine environments. 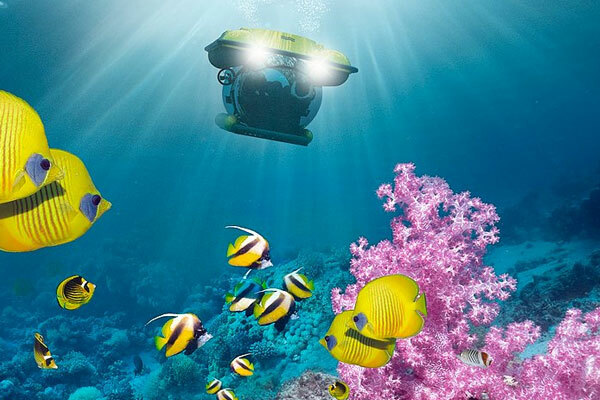 From inside the U-Boat Worx submersibles, each guest will enjoy an uninterrupted view thanks to the strategic placement of all components and the use of an ultra-clear acrylic hull, expertly engineered to make you feel at one with the ocean,” Moroney said. they pop out from below the ocean with a splash,” Moroney explained. For more, go to www.scenic.ca.